Vining Marine has offices on the Waikawa Marina, Nelson Marina, Westhaven Marina and the Opua Marine plus Marine Brokers right around New Zealand giving us full nation wide coverage. Our team of full time professional Boat Brokers spares no effort nor wastes any opportunity to present your vessel to an interested buyer that contacts us. Many buyers will see your boat for sale for the first time on a web site; here at Vining Marine we regard the internet as our most valuable marketing tool. Vining Marine Ltd is a strong believer in the power of the internet and lists yachts and launches on the following sites: New Zealand wide on Trademe, Marinehub and Autobase , Worldwide on Yachtworld, in Australia on Yachthub and of course here on vinings.co.nz Our site features all our listings throughout New Zealand where you can check out a vessel by looking at good quality pictures and then view the vessels details in full, printing them off for future reference if required. We do not charge for any form of internet advertising - we meet the costs ourselves! We do not charge for placing ads in our normal advertising in these publications! If you wish to place large advertisements either half or full page we will arrange the ad for you and you will only be charged what the publications charge us - no hidden costs and no company mark ups! We can place advertising in other magazines for you at cost - no hidden charges, no company mark ups! We produce a full set of Colour Photos and Specs to handout or email to buyers at our expense not yours! Check out our great location on the Waikawa Marina in Picton where we have seventeen sales berths in prime locations around the Marina. Our use of sign boards and flags draws buyers to have a look while they wander the marina in search of their "dream boat". 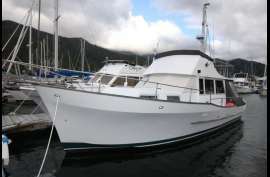 Out in Waikawa Bay we have 10 moorings available for those who may choose not to berth in the Marina, these are charged at a very realistic rate and we normally have a spare one or two to help out our Vendors. Our team of full time Professional Boat Brokers are dedicated boaties themselves (without exception!) and have been around Yachts and Launches for many years. In addition to discussing with you a fair market price, helping you to prepare the listing details and marketing your vessel they will keep you well informed of progress and inquiries and negotiate on your behalf when an offer comes in. They will be aboard for any Sea Trial and make arrangements for the various marine related tradespeople that become involved to inspect your vessel after the buyer selects a Surveyor. Our Boat Brokers do their best to ensure that the sale goes smoothly for the Vendor and all concerned. At Vining Marine we believe that Sole Agency Listings should get special treatment so we ensure that they do! Talk to our Brokers about other advantages in Listing "Sole Agency" with Vining Marine. Little wonder that our reputation is that we are "good people to do business with"!